The American fighter pilot who became the first to shoot down an enemy aircraft in battle in 18 years has broken his silence about the experience in an interview with British military outlet SavetheRoyalNavy.org. Navy Lt. Cmdr. Michael Tremel, an F/A-18E Super Hornet pilot assigned to Strike Fighter Squadron 87 aboard the carrier USS George H.W. 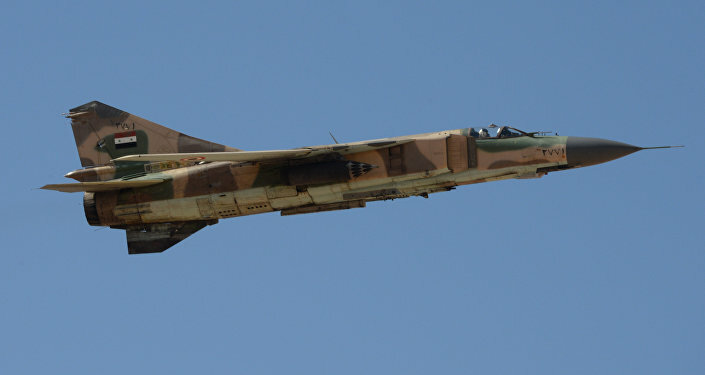 Bush, says the entire fateful battle with a Syrian Air Force Su-22 Fitter on June 18 lasted about eight minutes. Tremel engaged a Syrian pilot who had been dropping munitions on US-aligned Syrian Democratic Forces south of the city of Tabqah in the Raqqa Governorate. Tremel made the call to shoot the plane down himself. In a report issued after the incident, US officials added that the Su-22 was shot down in accordance with the rules of engagement, with Tremel's first missile (an infrared-guided AIM-9X Sidewinder) missing and his second (a radar-guided AIM-120 AMRAAM) finding its mark. "I did not directly communicate with the Syrian jet, but he was given several warnings by our supporting [E-3 Sentry Airborne Early Warning and Control] aircraft," Tremel said, according to the report. "So yes, we released ordnance and yes it hit a target that was in the air, but it really just came back to defending those guys that were doing the hard job on the ground and taking that ground back from [Daesh]." Tremel added that he didn't see the Syrian pilot eject, but his wingman did. He downplayed his own accomplishment in his comments. "When you think about the shoot-down, in the grand scheme of things… [my wing-man and I] flew over 400 missions in support of friendly forces on the ground." In January, the USS Bush deployed from its homeport in Norfolk, Virginia, and undertook a six-month campaign of airstrikes against Daesh from the Persian Gulf as part of Operation Inherent Resolve. The Bush's deployment is wrapping up, but it will immediately be replaced with another aircraft carrier: the USS Nimitz. Russia was so infuriated by the American shootdown that Moscow declared the entire western half of Syria a no-fly zone for US aircraft. "Any aircraft, including planes and drones of the international coalition, detected in the operation areas west of the Euphrates River by the Russian air forces will be followed by Russian ground-based air defense and air defense aircraft as air targets," the Russian Defense Ministry said in a statement. Russia might not be happy with Tremel, but he had nothing but good things to say about them. Speaking of his encounters with Russian aircraft in the unfriendly skies over Syria, Tremel said that "they behaved with great professionalism at all times." Earlier in June, a US aircraft shot down an Iranian drone in the first US air-to-air engagement of an aircraft since 2009. The last time a US pilot made an air-to-air kill was during the NATO bombing campaign in Kosovo in 1999.